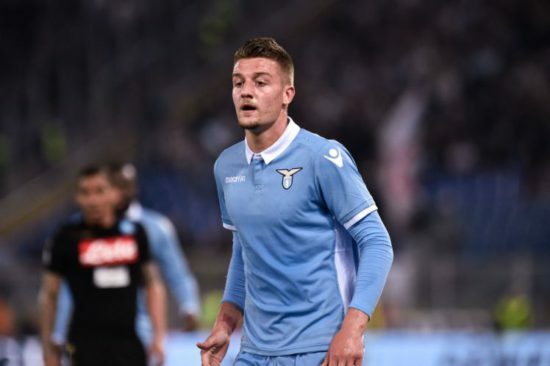 Manchester United have been linked with a move for Lazio playmaker star Sergej Milinkovic-Savic, as it reported that Jose Mourinho welcomes the idea of having the young attacker in his side. Italian news source Calciomercato runs an exclusive that officials from Manchester United were in attendance to watch star Milinkovic-Savic in action for Lazio against Sampdoria in which the star was impressive – scoring one and providing an assist for his side. The 21-year-old has seen his stock rise in Europe since he burst onto the scene for Lazio in 2016. He has continued to perform consistently for the Italian side from their midfield, attracting interests from top dogs such as Juventus and Manchester City. Man United’s supposed interest in the midfielder comes as a shock since the club have been chasing Tottenham’s left back Danny Rose who is reported to be the primary target in January. Reports emerged earlier this week that a transfer war-chest in the region of 80 million has been made available to conduct business in January, hence he may be spending all that amount on Milinkovic-Savic who is valued at €80 million (£70 million). Henrikh Mkhitaryan has failed to impress Mourinho of late, as a result, the boss may be looking elsewhere for fresh legs in his midfield if the Armenian international fails to regain his blistering form which saw delivering assists from his boots earlier on in the season.